The government will infuse Rs 830 billion into public sector banks in the remaining months of 2018-19, taking capital injection into lenders to Rs 1.06 trillion in the year. Of this, it has sought Parliament’s approval for Rs 410 billion through the second batch of the supplementary demand for grants. The Budget had announced a capital infusion of Rs 650 billion. Financial Services Secretary Rajiv Kumar said there were three non-PCA banks that were near the PCA limit, and four-five PCA banks that could come out of PCA. Besides, it would help lenders such as Punjab National Bank (PNB) which have breached some PCA norms to not land in this group, Jaitley told reporters. Kumar said PNB was a non-PCA bank which came close to the PCA threshold and that the Department of Financial Services would soon decide how much to infuse into each bank. He said banks like State Bank of India, Bank of Baroda, Vijaya Bank and Indian Bank would not require capitalisation. Though the government has not given a break-up of the infusion, capital may be provided to the entity arising out of the merger of Bank of Baroda, Dena Bank and Vijay Bank as the finance minister said the provision would strengthen amalgamating banks by providing regulatory and growth capital. “We want to ensure the compliance of banks to even higher than the international regulatory standards. The government's measure ensures we work from a position of strength,” Kumar told Business Standard. The supplementary demand, tabled in the Lok Sabha on Thursday, also seeks Rs 2.5 billion for providing additional equity investment in the form of bonus shares issued by Oil India Ltd, Rs 53.43 billion for the Railways, Rs 2.47 towards interest subvention for incremental credit to micro, small and medium enterprises and Rs 5 billion for creating capital assets to the National Ganga River Basin Authority. Though the size of the supplementary is Rs 859.5 billion, the exchequer will take a hit of Rs 150.6 billion as the remaining sum would be matched by equal savings in other departments. Banks’ recapitalisation will be in the form of bonds and hence will have no impact on the fiscal deficit target, Jaitley said. In a bid to ease liquidity flow in the financial system, the Union government had earlier petitioned the RBI to bring some banks, including Bank of India, out of the PCA framework on account of an improved financial situation. Eleven PSBs are under the RBI's PCA — an early warning mechanism to restore the health of banks — facing certain lending restrictions. A finance ministry official said following the commitment towards their capital requirements, the government expects four-five banks to move out of PCA. The government had announced a Rs 2.11 trillion recapitalisation plan for PSBs in October 2017. This included a plan to infuse Rs 1.35 trillion through recapitalisation bonds. Last year, the government had infused Rs 880 billion into PSBs and this year so far the government has injected Rs 229 billion. However, several factors such as slower recovery from National Company Law Tribunal cases, higher provisioning requirements due to the RBI's February 12 circular on stressed assets, and PSBs' inability to raise funds from the market came into play, leading to stress in capital needs of banks. Kumar said since the Rs 2.11 trillion recapitalisation programme was announced, banks had on their own raised Rs 244 billion. Jaitley said the recognition of toxic assets in the banking system, initiated by former Reserve Bank of India Governor Raghuram Rajan in 2015, was nearing completion. “The recognition of NPAs has made a considerable headway, it is almost complete and at a time where it had peaked in March 2015 the non-recognition was to the extent of 7 per cent, that now is about 0.59 per cent. 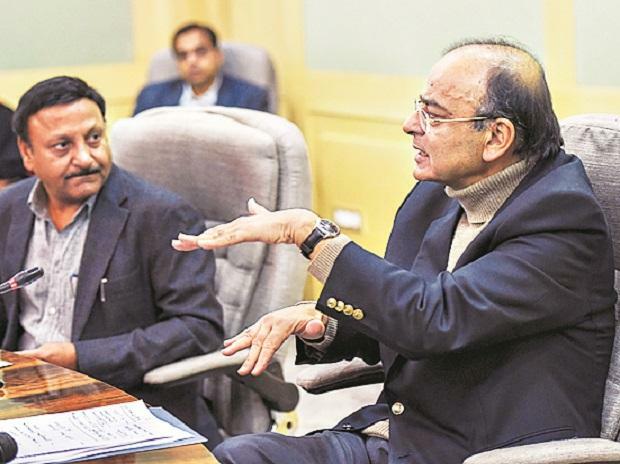 So high provisioning has already been made by the banks as a result of disciplining which has taken place in the last few years,” Jaitley said. The government on Thursday sought approval from Parliament for equity infusion worth Rs 23.45 billion into struggling Air India and another Rs 13 billion for Air India Asset Holding. As part of efforts to revive the financial fortunes of the national carrier, the government has decided to transfer debt worth Rs 290 billion to Air India Asset Holding Company, a special purpose vehicle.